The Battle of Britain 1940 WWII DVD contains (3) films that cover the British defense against German aerial warfare, an RAF bombing mission on Germany, and Edward R. Murrow in Dover, England during German bombing. Film #1 - The Battle of Britain 1940 - The British defense against German aerial warfare. Emphasizes the courage of the people and the skill of the Royal Air Force. Explains Hitler's plan for invading England after gaining air superiority. Shows invasion defense training, RAF pilots manning planes and downing Germans, bombing of industrial cities and attacks on London, activities during air raids, and records the bombing of London on Christmas Eve, causing the largest recorded fire in history. Run-time of 55 minutes in B&W. Film #2 - Target for Tonight 1942 - Dramatizes the planning and the execution of a bombing raid on Freihausen, Germany. The target is selected and filtered through the chain of command. Emphasizes problems encountered by one of the planes as enemy fire wounds a crew member and disables the bomber. Fog conceals the runway making landing very difficult. Run-time of 51 minutes in B&W. Film #3 - Dover 1942 - During the German bombing of Dover. Narrated by newsman Edward R. Murrow. Run-time of 10 minutes in B&W. 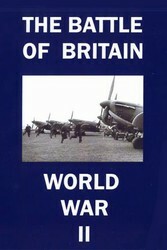 Total run time for The Battle of Britain 1940 WWII DVD is about 1 hour, 56 minutes in B&W. Format is NTSC DVD.